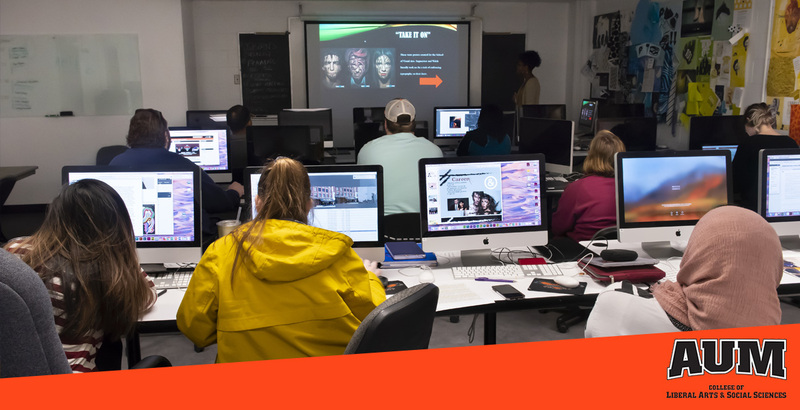 Combine your creativity with expertise much in demand in AUM’s Graphic Design concentration. You’ll spend most of your time getting practical, hands-on experience. Classes in drawing, digital photography, computer graphics, and typography will give you the technical mastery of the skills you’ll need to take a project from conception to completion. You’ll build a professional portfolio, and many AUM Graphic Design students get paid internships at firms like Stamp Idea Group in Montgomery that lead to permanent jobs after graduation. Graphic Design is a concentration in the Bachelor of Fine Arts in Art degree. AUM Graphic Design students routinely submit their work to national and local shows and exhibitions and competitions, often earning top prizes. A recent survey found that 90 percent of graphic design graduates were employed in the field of their choice. Graphic design at AUM has its own studio space with state-of-the-art equipment. A concentration in graphic design is excellent preparation for employment in a variety of fields. Jobs in art and design are projected to grow by 2 percent from 2014 to 2024, adding an additional 16,700 jobs to the economy. At $43,110, the most recent median annual wage for art and design occupations was higher than the median annual wage for all occupations. Brittany Roberson was the Outstanding Student for the Department of Fine Arts and the Chancellor's Scholar for the College of Arts and Sciences in Spring 2018. Ms. Roberson is currently the vice president of the Montgomery chapter of the American Advertising Federation. Eric Fountain is a Merchandising Design Supervisor at Saks Fifth Avenue, Birmingham. Anna Hudman is a Set Designer at Walt Disney World Resort, Orlando, Fla.
Chris Mills is Art Director at Razorfish, Atlanta. Jacob Pugh is Director of Marketing at MMI Outdoors, Montgomery. Emphasis on skills needed to produce vector and faster-based graphics to solve problems in design and layout. Prerequisite VISU 1102. Exploring color, grid and layout systems to solve graphic communication problems. Implementation of design skills from previous design courses. Concentration on research, varying design approaches and final communication solutions. Exploring contemporary letterforms with emphasis on the creative use of type in a digital format. Introduction to html, basic and advanced techniques of web design. Programming not required. Prerequisite VISU 2702. Motion graphics output to different formats, with emphasis on effective problem solving using professional processes. Development of design strategies and solutions as they relate to marketing, branding, and advertising for products and services. Prerequisite VISU 3732. A presentation of information regarding the social and cultural impact, artistic value and historical significance of graphic design worldwide. A senior project culminating the Studio or Graphic Design emphasis under the direction of the student's concentration advisor in painting, printmaking, sculpture, ceramics or graphic design. The student will make a presentation of their artwork for review by the Fine Arts Faculty.